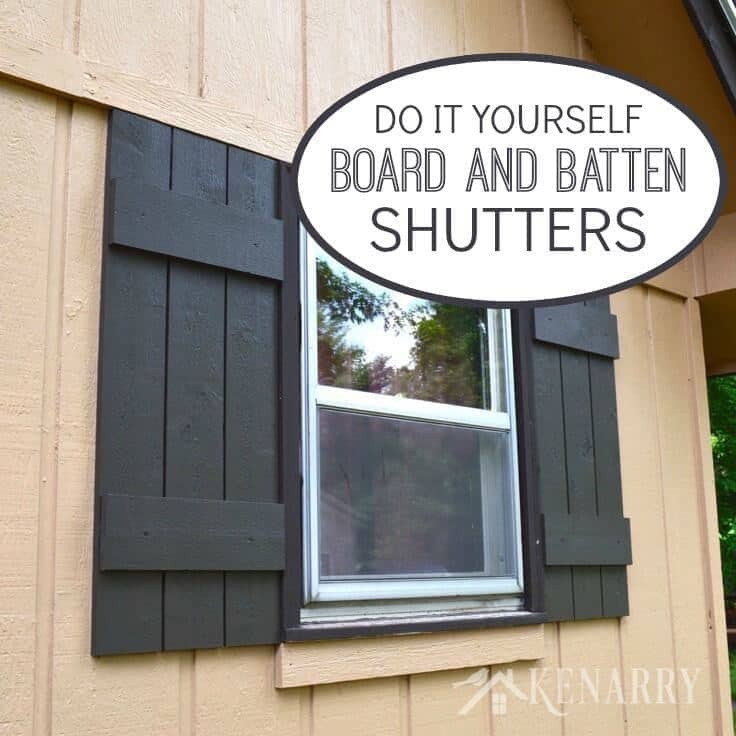 Follow this easy DIY tutorial to learn how to make board and batten shutters.Using this method you can build shutters of any size and add rustic charm to your home or cottage. 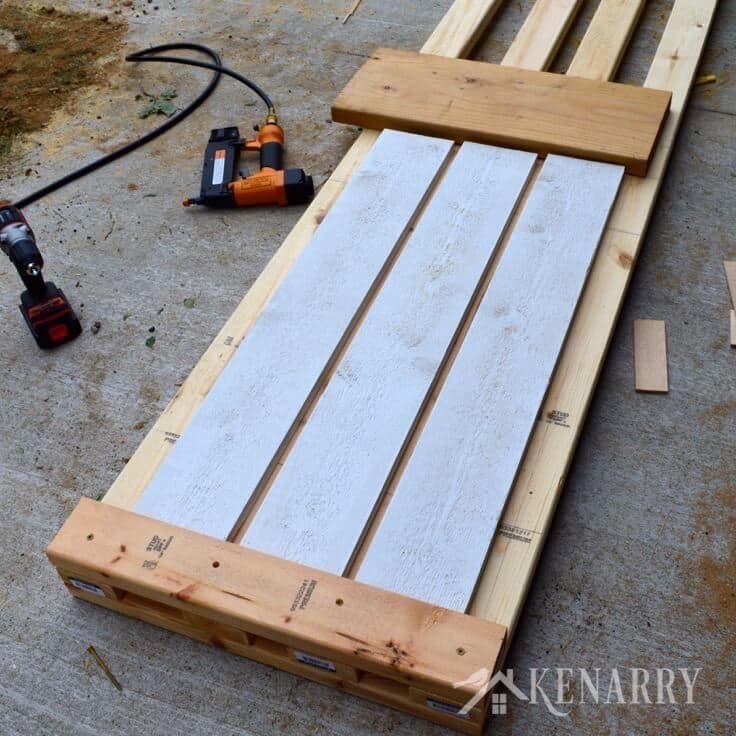 Using lumber and this easy tutorial you can create your own board and batten shutters to give farmhouse style to your home’s exterior. Carrie and I have a list of home improvement items that we’re constantly updating. As time and money become available we’ll pick a project off that list to work on. One of those list items that had been hanging around for a while was to refresh the look of the front of our cottage. For years, Carrie has been talking about removing the overhead power lines that feed into the front of the cottage as well as putting up decorative shutters around the cottage and pole barn. As you can see from the picture below, the two projects were intertwined as the power line feeding the meter interfered with the decorative shutters on the front of the house. Because we wanted the costly electrical move completed first, the low-cost DIY shutter project was put on the back burner. When we decided to put up a pole barn a couple of years ago, we finally had the opportunity to run underground electrical to the cottage. It wasn’t long after completing the pole barn that Carrie started dropping hints that she’d really like some shutters on the cottage and pole barn! 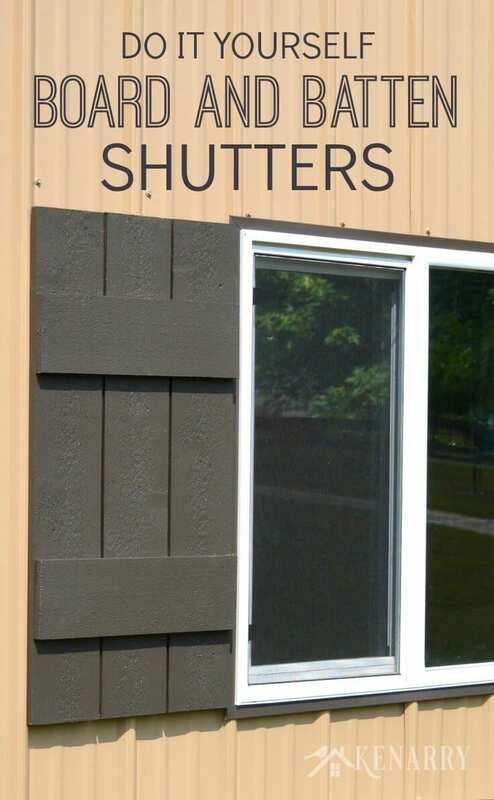 Fortunately for me, her taste in shutters is pretty basic, and creating them was a fun, easy, and cheap project. By following these simple instructions, you too can give your home or cottage a refreshed look! 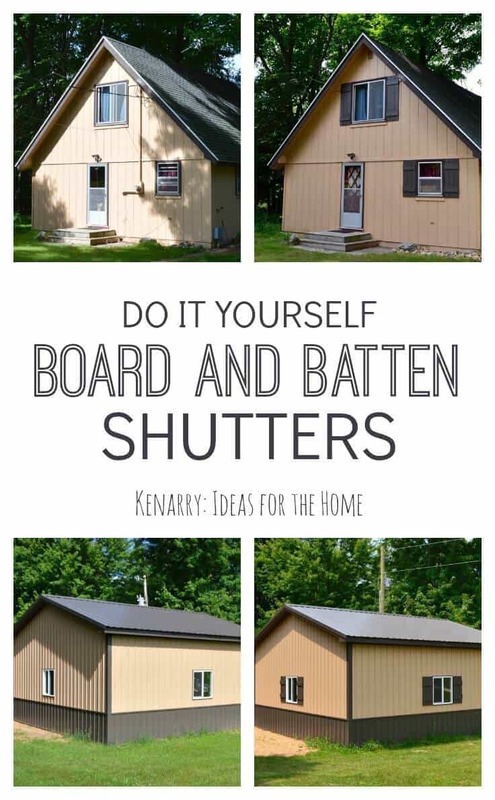 These board and batten shutters are cheap and easy to make with minimal equipment. This is a great weekend project that can greatly increase the visual appeal of your home or cottage. 1. Design and plan your shutters. 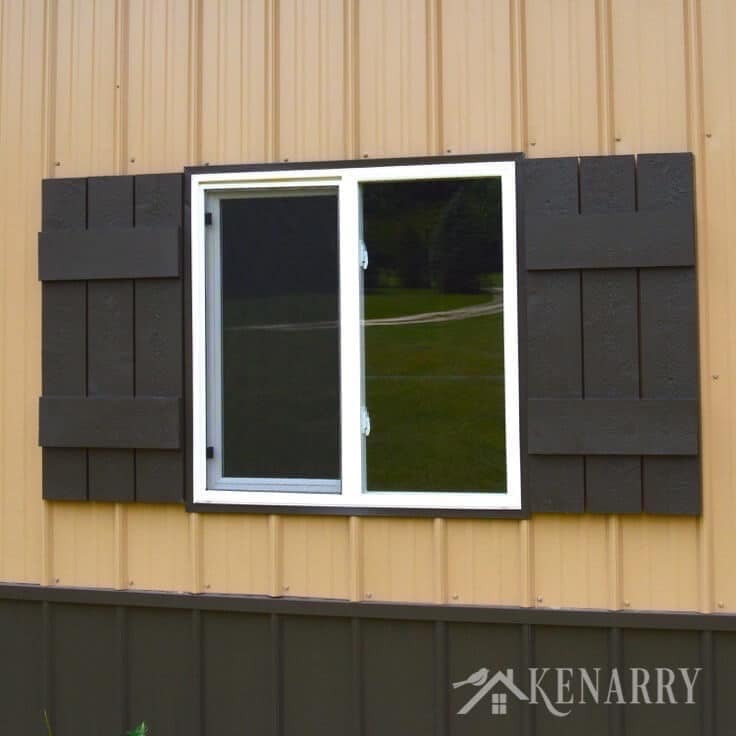 Each window will require two shutter assemblies and each shutter assembly consists of 3 vertical boards and 2 horizontal boards. For each window, determine the height of the shutter you desire as well as the gap you desire between the vertical boards. Your horizontal board length will be determined by adding the width of the 3 vertical boards plus the 2 gaps of your choosing. Plan in advance to figure out exactly how many boards you need to buy. I was able to save some money by optimizing the length of boards I purchased to minimize wasted material. 2. Prime the boards. Lay out all your boards on saw horses and apply the primer with a roller. Make sure you cover all of the exposed edges and paint both sides. 3. Create a jig for consistent results. If you’re doing more than a couple of shutters the time spent creating a jig will be well worth it. As you can see in the picture below, I simply used some 2 x 4’s fastened with screws to create an adjustable assembly fixture. 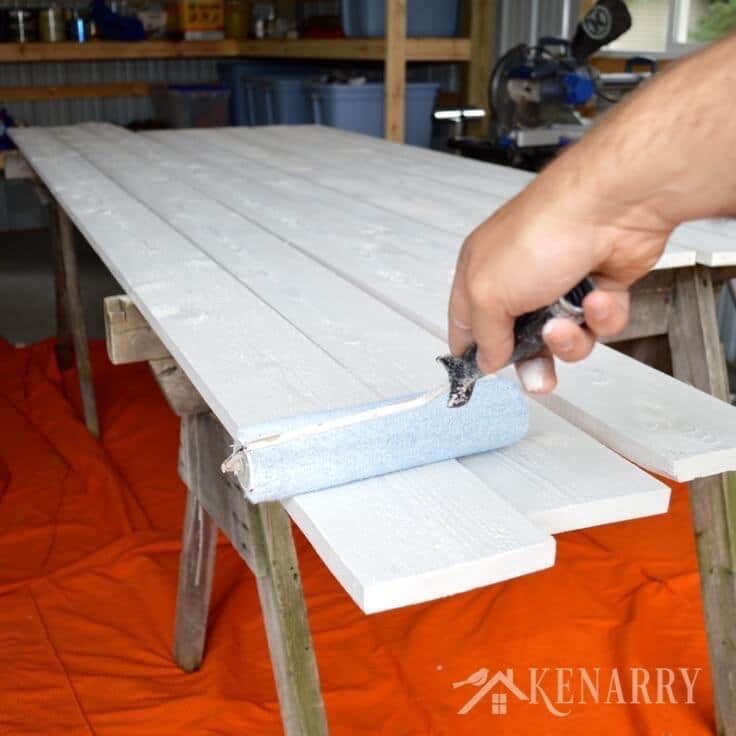 The top 2 x 6 simply floats and is used to press everything tight and keep the boards square. It’s important that you cut your boards square to start out with. I purchased a light duty sliding compound miter saw a few years back with a collapsible stand that has been a workhorse for me, making projects like this very simple. Once you have the basic frame done, find some scrap pieces the width that you want your gaps and cut them to the length that you want the cross members to form the end. Make 4 identical pieces. You can see below that I used some extra trim pieces from another project. Once you have these you can lay in your 3 vertical boards and then place your spacers. Such a simple update and it make such a big difference! These are great. I agree, Stacey! They make a huge difference in the outward appearance of the place. Thanks for coming by to check out the tutorial! Your new shutters look so nice! 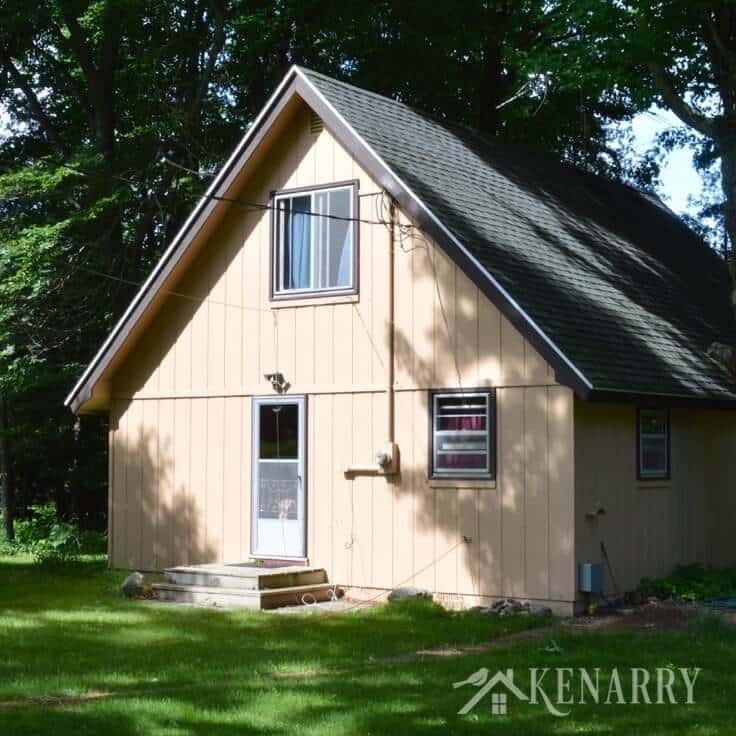 It really added some charm to your cottage and pole barn! I am getting ready to start hosting a new link party with Refresh Living starting this coming Tuesday @ 7pm CST. We would love to have you join us! Thanks, Cat – both for your kind words, and the invitation to your new party! I love these! 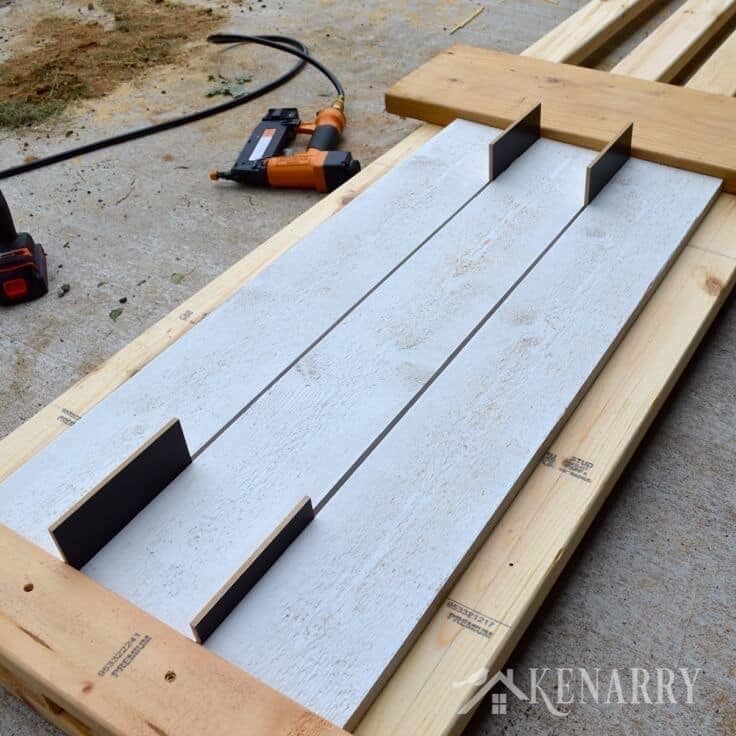 These shutters really make a big difference, and how perfect that you were able to make them yourself! Thanks for linking up with us at Motivational Monday! Thank you, Melanie! We are just thrilled with how they dress up the place. Thanks for coming by from Motivational Monday! Thanks, Cathy! They’re surprisingly simple, but do make a dramatic difference. We appreciate that you came by to check them out. Thanks, Heather! We love shutters too – especially rustic, simple ones. Thanks for visiting from your link party. What a great makeover! You are smart to choose the color. Black is a kind of neutral color so that it looks fit with the windows. How much money do you spend to make it? Hi Katie! Thanks for the comment. 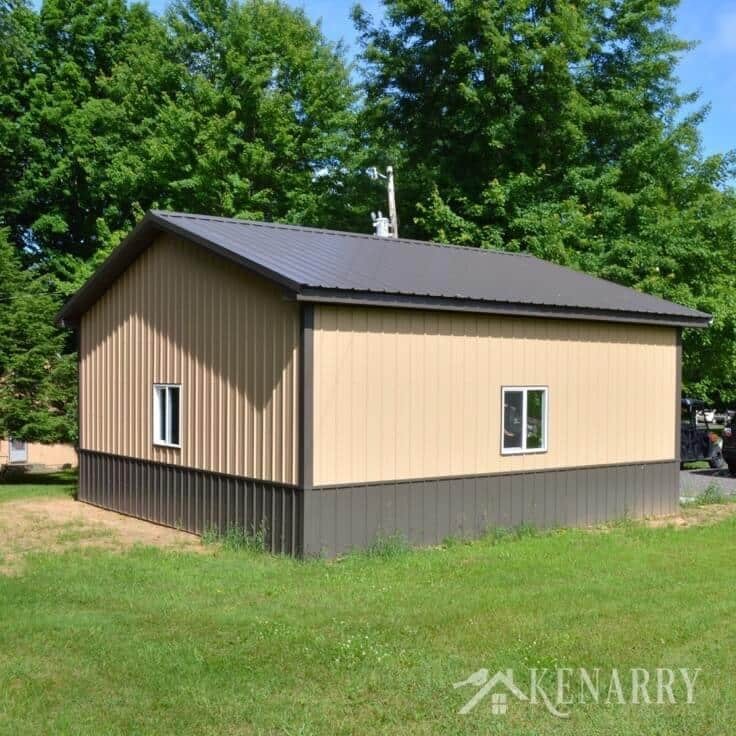 The color is actually called “Manix Bronze”, we chose it to match the dark two-tone metal siding. The cost per set of shutters for us was around $65, but that will vary depending on the size of the shutter. I hope that helps! Is the inside of your metal sided building not finished? I have a similar post-beam building with the metal siding that I want to attach shutters to. The inside is dry-walled though so all I have are photos of when we were building to guide me to where studs would be. Any tips on how to find the studs on the outside of the metal siding? Thanks for reading and good luck with your project! Love this idea!….hope to have my husband do these for our house!!! Thanks Joan! We’re glad you found our tutorial and hope it helps inspire you and your husband as you make your own. We’d love to see pictures when you’re done. Is that a Flat, Satin, Egg Shell, etc… paint? We have a flat/matte brown and wondering if we need something with a little bit of a shin to it. Yours looked like it had some what of a shin but may have been just the light/pic. Hi Millard, great question! I just looked ours up — the paint we used was an exterior acrylic latex paint with a flat finish. The flat/matte brown you have should work great if you want it to look similar to ours. Good luck with your project. 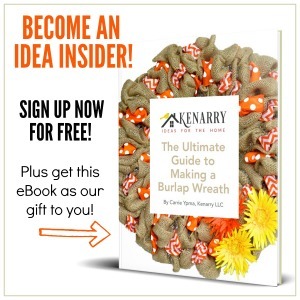 We’d love to see photos when you’re done – post them on instagram and tag us @kenarryideas. The only thing missing for me is the dimension to locate the cross members. I’m sure you need them to be the same on each shutter. Does it depend on the size of the window? Hello! And thanks for taking the time to look at my tutorial. The cross member location is mainly a matter of personal preference and may vary depending on the size of the shutter. To do mine I laid out the pieces on the ground and set the proportions based on what looked right to me (and more importantly what looked right to Carrie!). To make the standardization easy I cut my spacer shims to the length I determined looked right so they served a dual purpose, getting the gapping right between the long vertical boards and setting the distance to the cross members from each end. So in short, pick something that looks good to you and go with it! Good luck on your project! I have a little OCD also, so i can definitely relate! I hope the project turned out to your liking. I love your shutters and am planning to make these for our lake cabin. I am making my materials list and would like your advice on the attachment hardware (screws). Our cabin is cypress wood exterior, basically in the shape of a long old fashioned shingle overlapping. How do I find a stud to attach the shutter to and what type and length if screw? Thank you for reaching out to us! I absolutely love the look of cypress, I’m sure your cabin looks great! I used an electronic stud finder to locate the studs on my project. If you don’t want to spend the money on that you can buy a magnetic stud finder relatively cheap which will locate the nails used to attach the siding to the studs. With a bit of work you should be able to establish the stud location. As for the length of screw, that will depend on the weight of the shutter and the type of fastener you use. I would recommend checking with the screw manufacturer you intend to use. Thank you! I have a magnetic stud finder. How have these held up? Do they need repainted frequently? Great question, Tammy! We’ve had them up for three years now and they’re holding up really well. We have not repainted them yet and they don’t appear to need it anytime soon. We just had to do some minor touch up painting when we nicked up the front one when we added the new front porch last summer. Otherwise, they look great still!